The Spanish Synagogue (Španělská synagoga) in Prague is known as the most beautiful synagogue in Europe. Set in the heart of the Jewish Quarter, it is certainly a stunning sight. The Spanish Synagogue was built in 1868 on the site of the oldest Prague Jewish house of prayer ("the Old Shul"). It was designed in a Moorish style by Vojtěch Ignátz Ullmann. Its interior, including the stained glass windows, were designed by the architects A. Baum and B. Munzberg, and completed in 1893. The Spanish Synagogue has a regular square plan with a large dome surmounting the central space. On three sides are galleries which open onto the nave. The remarkable interior decoration features a low stucco arabesque of stylized Islamic motifs which are also applied to the walls, doors and gallery balustrades. Under both Nazi and Communist rule the Spanish Synagogue was neglected, fell into a sorry state, and was eventually closed. But in the latter part of the 20th century the Jewish Museum in Prague took control, and began work on its restoration. 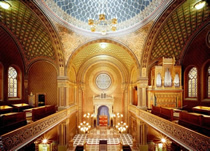 The Spanish Synagogue re-opened on the 130th anniversary of its establishment. People can visit this magnificent building in the daytime by purchasing a ticket for the Jewish Museum in Prague, which gains you entrance to several other Jewish Quarter monuments too. Alternatively, visitors can go on a Jewish Quarter Walking Tour. In the evening, the Spanish Synagogue becomes a wonderful setting for classical music concerts. During the winter the interior of the Spanish Synagogue is heated, but it is advisable to wear warm clothing for the concerts. Note: On 01 June 2019 the Spanish Synagogue will close for renovation. Concerts from this time will be transferred to Maisel Synagogue.